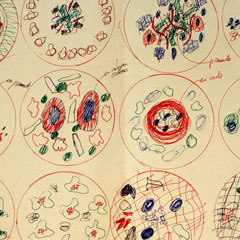 Ferran Adrià: Notes on Creativity is the first major museum exhibition to focus on the visualization and drawing practices of master chef Ferran Adrià. The exhibition emphasizes the role of drawing in Adrià’s quest to understand creativity. His complex body of work positions the medium as both a philosophical tool—used to organize and convey knowledge, meaning, and signification-—as well as a physical object—used to synthesize over twenty years of innovation in the kitchen. As one of the most important avant-garde chefs of the twenty-first century, Adrià pushes culinary boundaries with both knowledge and wit, transforming the art of cooking into an art of food. Hundreds of notebooks have been filled with concepts, ideas, collaged photographs, and loose sketches for new dishes for elBulli. More straightforward creative methods in the form of lists, tables of ingredients, and cooking methods have also been used to synthesize ingredients and conceptualize new ways of cooking. The use of drawing to articulate cuisine as both a product and a concept is indicative of a creative model that is always in flux. Ferran Adrià: Notes on Creativity charts the origins of this innovator’s intellectual and philosophical ideas about gastronomy that have forever changed how we understand food. A tour of the show will include ACE Gallery, Los Angeles, May 4 – July 31, 2014; MOCA Cleveland, September 26, 2014 – January 18, 2015; and Minneapolis Institute of Arts, September 17, 2015 – January 3, 2016.